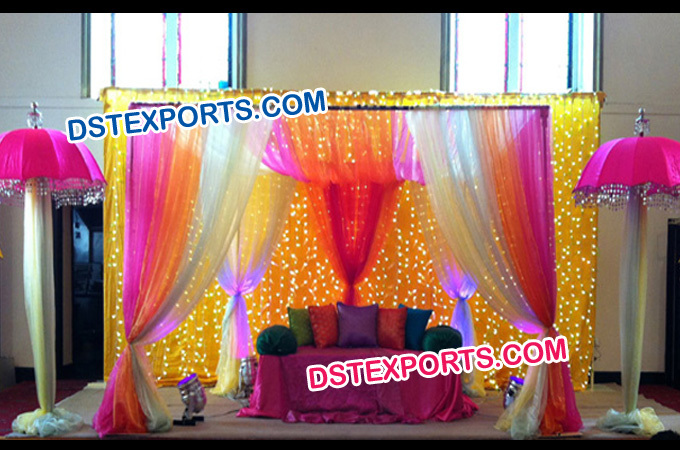 We are manufacturer supplier and exporter of all type wedding stage decoration sets. We are manufacturer Indian wedding stages reception stages ring ceromany stages asian wedding stages hindu wedding stages muslim wedding stages mehandi stage decorations. We design these mandaps in compliance with the modern trend by making use of high grade quality materials under the supervision of our skilled and experienced workforceWe can also manufacture as per color and shape like round ,square, halfmoon We manufacture pillars furnitures backdrops and all other wedding decoration items for decorate stage sets.Our stage decoration items will make wedding stage very beautiful. These stage decorations are totally folding an decoration items will make wedding stage very beautiful. These stage decorations are totally folding and very easy to assemble.